Many bulbuls are quite social; some readily join mixed-species groups, others flock with members of their own species. Perhaps the most gregarious bulbul is the spotted greenbul (Ixonotus guttatus). A distinctively colored bird, gray-olive with white spots on its wings and rump, the spotted greenbul is very social, traveling in monospecific groups of five to 50 birds. The groups work their way quickly through trees, never staying long, even if there is plenty of fruit. While briefly at rest they sit very close together on a branch, preening and flicking the wings and tail. The striated bulbul (Pycnonotus striatus), so named because of the yellow-streaking on its underparts and white-streaked upper body, lives in active noisy flocks of six to 15 birds, as does the yellow-browed bulbul (Hypsipetes indicus). The yellow-streaked greenbul (Phyllastrephus flavostriatus), Ca-banis's greenbul (P. cabanisi), and Sjostedt's honeyguide green-bul (Baeopogon clamans) often join mixed-species flocks, traveling right behind or mixed in with other bird species. Bulbuls can be quite aggressive towards members of their own species, and other species as well. 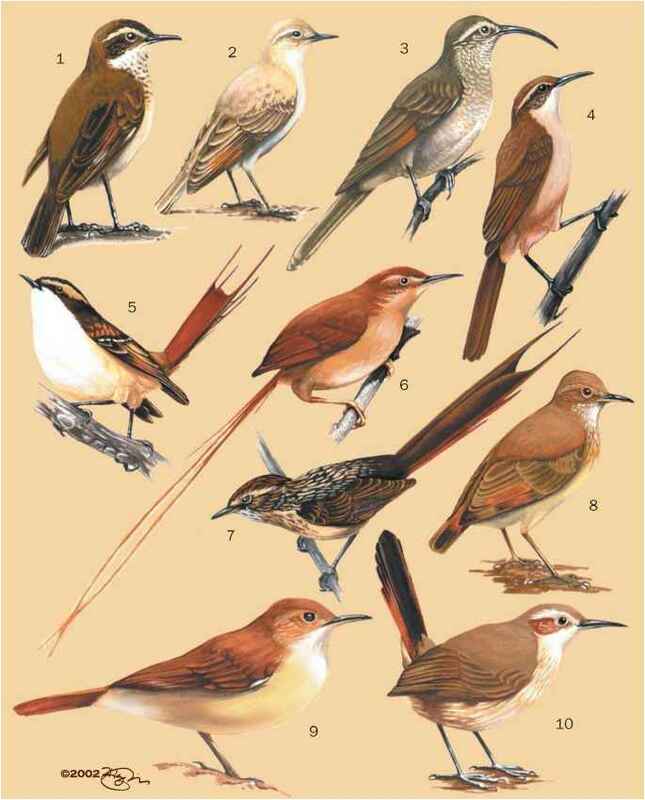 Some, such as the puff-throated bulbul (Criniger pallidus) and the mountain bulbul (Hypsipetes mcclellandii) will aggressively mob birds of prey. If the face-off is against a bulbul of the same species, the threat display may be different than against other birds. Among Pycnonotus, there are roughly three to seven threat displays. These include tail-flicking, tail-spreading, crest-raising, un-dertail-covert spreading, wing-flicking-and-spreading, and crouch display (the latter may also be an appeasement display). The red-vented bulbul has been observed attacking birds by poking with its bill. The red-tailed greenbul (Criniger calurus) and other Criniger bulbuls will puff out their fluffy beard-like throat feathers, both as a preening gesture and as an aggressive display. Most bulbuls have distinctive voices, and often the best way of distinguishing similar species is by their song. All over the map, their calls may be jolly phrases of three to six notes (Pycnonotus flavescens), cacophonous explosions of loud discordant babbles (Pycnonotus luteolus), or mewing cat-like calls (Hypsipetes mcclellandii and H. leucocaphalus). Typically, their voices have a gravelly quality, many are chattery and noisy, some with whistles. Very few are actually musical. Most sing in the morning or evening, and many of the more social species will chatter as they forage. The somber greenbul (Py-cnonotus importunus) constantly advertises its presence with its distinctive song, a series of clear strong notes "ti-ti-wer cheeo-cheeo cheeo-wer chi-wee chi-wer chi-wee." A most persistent vocalist, this bird sings all day, even at midday, and all year. The name importunus is from "importunate," named because it sings persistently to the point of annoyance. Sadly, the species with the most celebrated song, the straw-headed bulbul (Pycnonotus zeylanicus) is now threatened as a result of being highly prized and traded for its voice. Described as "a prolonged series of magnificently warbled notes, richer and more powerful by far than the songs of such celebrated performers as the Nightingale and the blackbird," the song of the straw-headed bulbul is by no means typical of the Pycnonotidae. The majority of the Pycnonotidae are nonmigratory, either sedentary or only locally nomadic. Banding and recapture records from Asia indicate that some bulbuls remain in the same few hundred yard area for several years. A handful of the cooler-climate, temperate-zone species, such as the black bulbul (Hypsipetes madagascariensis), are partly migratory. Flocks of several hundred of these birds move to southern China in winter.